FED UP WITH POLITICAL CORRUPTION AND SO-CALLED “LEADERS” WHO REFUSE TO“PLAY BY THE RULES”? 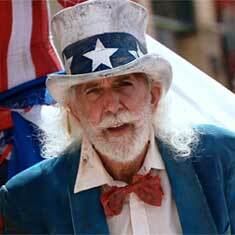 MEET JOHN CHAFFEE AKA “UNCLE SAM”! After 9/11, country superstar Toby Keith captured the collective vengeful anger of millions of Americans in his now classic hit “Courtesy Of The Red, White And Blue (The Angry American).” The song reflects a time when we all bonded together against a common enemy. Eight years later, we’re still at war with Al Qaeda, but a quick glimpse of our 24-hour news cycle reveals the disturbing truth: we’re also locked in a battle with each other, part of a political culture where crushing those who think differently is more important than coming together for the common good. In the same fiery spirit as the Keith song and with infectious country-bluegrass flair to spare, Chaffee gives voice to millions of his fellow frustrated Americans with a song and video concept that grew out of his growing anger over a daily dose of stories of corruption and scandal, not only in our nation’s capital but also in communities across the country. The clever costuming idea of “Uncle Sam” in 70s era Fee Waybill (The Tubes) styled red, white and blue platform boots came from an image of the bearded, top-hat wearing icon that Chaffee saw when he discovered an old document called the “Citizen’s Rule Book.” The music was recorded with prominent Nashville studio musicians at that city’s Trax Studios and the video was shot by Cleveland based film director and videographer Ted Sikora of Commercial Recording. Hoping to Draw More Attention to Illnesses That Have Affected Such Icons As Melissa Etheridge, Christina Applegate, Sheryl Crow and Olivia Newton-John, Chaffee Is Donating A Portion Of The Proceeds From Sales Of The Single To Breast Cancer and Ovarian Cancer Organizations. A true holiday classic, “Someone Is Missing At Christmas” is an emotionally gripping song whose moving melody and touching lyrics offer empathy, hope and inspiration to anyone who is grieving the recent passing of someone close to them or who is separated from a person they love. Written by Cleveland based songwriter John C. Chaffee, Jr. in 2003 upon the death of his just turned 62-year-old sister Lyn—a 21 year breast cancer survivor–from ovarian cancer, “Someone…,” featuring the warm and heartfelt vocals of singer Anne Cochran, has become a cherished modern holiday classic since its release to radio and retail in 2005, when it reached #11 on Billboard’s AC chart. Chaffee made the song available for purchase on his website, www.patriciamusic.com, as well as Amazon.com, CDBaby, iTunes, Rhapsody, Emusic, MSN Music, Rhapsody, Napster, Sony Connect and Liquid Digital Media. In honor of Chaffee’s late sister Lyn, Chaffee is donating a portion of the proceeds from “Someone Is Missing At Christmas” to organizations dedicated to finding the cure for breast and ovarian cancer. He has been encouraged by the greater public awareness of both illnesses that has resulted from the candidness of many pop culture icons as they have publicly shared details of their own personal battles, setbacks and triumphs, including Melissa Etheridge, Christina Applegate, Sheryl Crow and Olivia Newton-John. Aside from touching people’s hearts with “Someone Is Missing This Christmas,” the composer hopes that the song will draw further attention to these crucial causes that impact so many women around the world. Beyond widespread critical acclaim for the song, Chaffee has been touched over the past three years by the loving responses the song has elicited from listeners on retail websites like CD Baby. In many cases, it prompts them to share with the songwriter their own personal experiences. Chaffee’s belief in the power of the song to touch and heal people’s hearts drives him every year to both pitch it to more recording artists and promote the original version to some of the U.S.’s most influential pop Christmas stations. He is appreciative and humbled by the outpouring of love “Someone Is Missing At Christmas” has received and simply wants to keep sharing it with a wider audience over time.